What to Do if You’re Out of Gas on the Highway? Imagine driving home from a long distance trip, and realizing that your fuel tank is leaning towards that empty arrow. Normally, it wouldn’t be much of a problem, but the nearest gas station, is miles away. You might have enough gas to barely make it a few more miles, but you really don’t want to take any chances on the road. The first thing you want to do is immediately pull over to the side of the road. Once you’re completely out of harm’s way, you should then turn on your hazard signal. You’re going to need an emergency refueling here. The last thing you ever want to do is panic or get nervous. Help is just a phone call away! Once you’ve safely parked your vehicle to the side of the road, and called for help, you need to remain as calm as possible. It’s never a pleasant situation to get stuck on the road. Whether you need an emergency refueling or an emergency towing, we are here for you. At Emergency Towing, our reliable roadside crew, will be at your location to provide your empty tank with the gasoline that it desperately quenches. 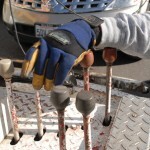 We work throughout the San Jose area, and as our name suggests, we are ready for you call. Our friendly support team will walk you through the entire process, step by step. All you need to do is give them a location, and a reliable technician will be there in less than an hour. You don’t have to keep your parked on the side of the road overnight, we’re already on the way! Whether you’re out of gas in the middle of a busy intersection or need an emergency towing, we’ll be there for you. Sometimes we don’t even pay close attention to the fuel tank, especially when you’re driving home at night, and you’re very tired. A yellow blinking light will usually indicate that your tank is thirsty, and needs gas right away. It’s taken us years to build the kind of reputation we have, and we go to great lengths to uphold it as well. We’re always proud to show you our testimonials, so please feel free to ask away. Don’t let a few drops of gas keep you from enjoying your day or getting home at night. Give us a call today, and keep our number stored on your phone, in case of emergencies like this.